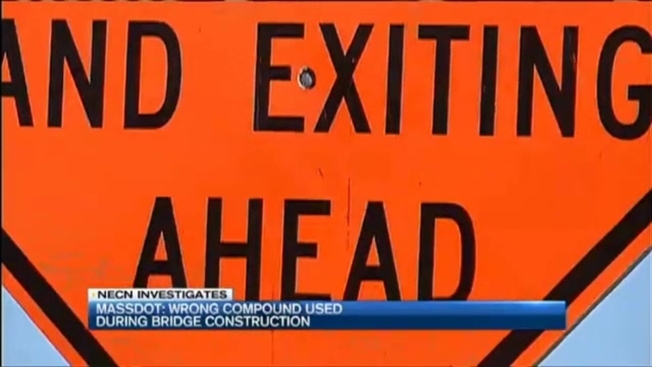 Officials say contractors messed up when they used the wrong kind of joint compound on a bridge that caused a 10-mile traffic nightmare on Rte 128 in Massachusetts Tuesday morning. Specifically, crews used a joint compound that was only appropriate for weather 45 degrees and warmer, according to Mike Verseckes at MassDOT. This stemmed from crews installing steel girder bridges that will carry the highway over a stretch from Route 135 to Great Plain Avenue. Verseckes says McCourt "assures them" they won't make that mistake again, and highway officials are inspecting the new expansion joint on the bridge to make sure safety has not been compromised. They are still waiting on word of the results. There is still much work left to do on the $98 million project that is scheduled to be finished by the end of the year.